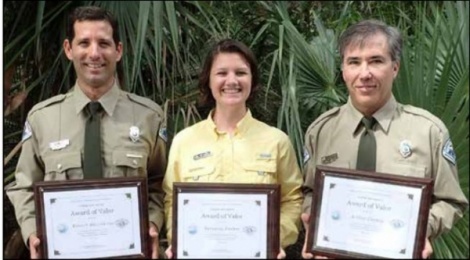 (North Palm Beach, FL) At the Florida State Park’s 2015 Division Award Winners meeting last week, Park Services Specialist, Art Carton, Ranger Rob Matriscino, and Director of Education, Veronica Frehm received the prestigious Award of Valor. They received the award for selflessly risking their lives to save two drowning visitors caught in a rip current at MacArthur Beach State Park last spring. Lu’s hard work and dedication to the Park Service was not only recog nized at the meeting last week, but she recently received a promotion to Assistant Park Manager at Bill Baggs Cape Florida State Park. “We will miss Lu and her amazing work ethic, but we are happy for her and know she will make a great Assistant Park Manager,” says Houghtelin. John D. MacArthur Beach State Park, Palm Beach County’s only state park, is situated on a barrier island between the Atlantic Ocean and the Lake Worth Lagoon. The Park is made up of 438 acres of pristine coastal land and contains four different communities or habitats including seven species of plants and 22 species of animals on the endangered or threatened list. MacArthur Beach is truly an “Island in Time! !